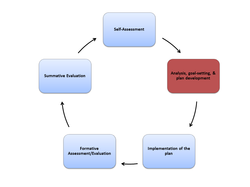 The documents below feature sample professional practice goals linked both to the Effective Teaching Rubric and the Massachusetts Curriculum Frameworks. The document below contains examples of whole school goals aligned with team / individual goals. This document contains a bank of strong goals that BPS teachers have written and will continue to be updated as more goals are collected.